Five Top-Five Finishes Paces LeTourneau Track In Season Opener In Houston. 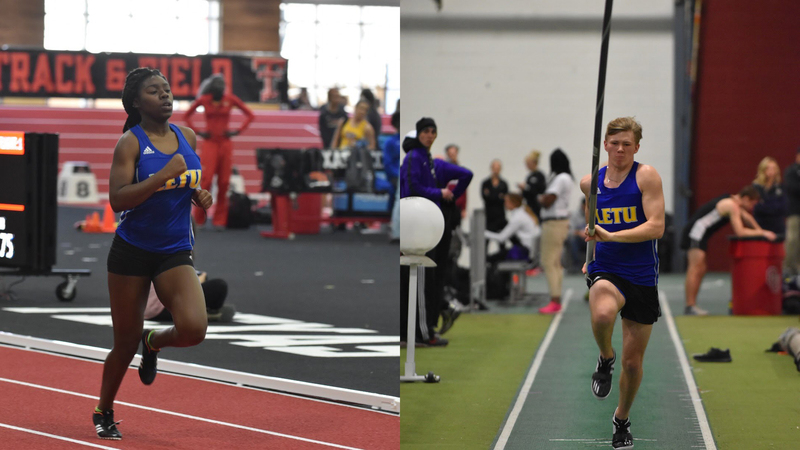 HOUSTON, Texas – Earning three top-five finishes on the men’s side and two top-five finishes on the women’s side, the LeTourneau University track and field team opened their 2019 campaign at the FasTrak Invitational at the Bill Yeoman Field House in Houston, Texas on Saturday, January 19. The meet, which did not keep team scores, featured a mix of NCAA Division I, II, and III teams as well as unattached athletes and NAIA squads. On the men’s side, the three top-five finishes came in the pole vault as Austin Parrish would lead the YellowJackets with a new indoor school record of 4.88 meters (16 feet) for a second-place finish. Sophomore Alex Hindman would take third in the event with a mark of 4.73 meters (15 ft. 6.25 in.) while Jack Miller took fourth (4.58 meters, 15 ft. 0.25 in.) and Collin Jones finished sixth (4.43 meters, 14 ft. 6.25 in.). Other field event results for the LETU men saw Stanley Williams take eighth in the long jump with a mark of 6.38 meters (20 ft. 11.25 in.) to shatter last year’s top indoor mark set by Keishaun McMillian while Jones took 11th with a score of 5.97 meters (19 ft. 7 in.) On the track side of things saw Williams run a time of 7.21 in the 60-meter dash and Nate Berlandier with a time of 7.61 as Williams would set his second indoor best of the day. Jones managed to also run in the 200 meters and finish with a time of 23.58 seconds which was nearly one second better than last year’s best indoor-season time while Dalton Heichelheim finished with a time of 53.86 in the 400 meters. The LeTourneau women would prove to be equally impressive in their season debut as Alexis Segura took second in the mile run with a time of 5:37.72 while Victoria Hood made her LeTourneau debut and took fourth with a time of 5:53.50. Finishing in the top-10 in the 60 meters would be Ro Galloway who took eighth with a time of 8.48 and Kristyn Matthews in 10th with a time of 8.56. Lexi Funk snagged an eighth-place finish in the 60-meter hurdles with a time of 11.11 and took ninth in the 400 meters (1:07.20). Galloway and Matthews would also combine for a pair of top-10 finishes in the 200 meters as Galloway took eighth (28.14) and Matthews ninth (29.52). In the field events, Rebekah Stevenson would be one of two competitors for the YellowJackets and compete in the shot put (10.62 meters, 34 ft. 10.25 in.) and weight throw (8.28 meters, 27 ft. 2 in.) finishing in 11th and 12th, respectively. Kaylee Packer would compete in the pole vault in her first collegiate meet but be unable to record a qualifying attempt in three tries. LeTourneau will return to action on Friday, January 25, when they travel to Lake Charles, Louisiana to take part in the McNeese State Indoor Invitational. LeTourneau Women’s Basketball Rally Finishes Just Short In 73-67 Home Loss To Louisiana College. LONGVIEW, Texas – A strong fourth quarter performance by the Louisiana College Wildcats was too much to overcome for the LeTourneau University women’s basketball team as they fell 73-67 at Solheim Arena on Saturday, January 19. The loss drops LETU to 5-12 on the season and 2-7 in American Southwest Conference action while the Wildcats improve to 7-9 overall with a 4-5 standing in the ASC. Points would be scarce through the opening 2:39 of play until four straight points from the Wildcats offense put an end to the drought. LC would hold their lead throughout the first quarter while the LETU offense would struggle and score only six points in the first ten minutes of play. Looking to overcome their first quarter troubles, the YellowJackets would come out hot by snagging the first four points of the second quarter and taking their early lead of the game at 20-19 with seven minutes remaining in half. 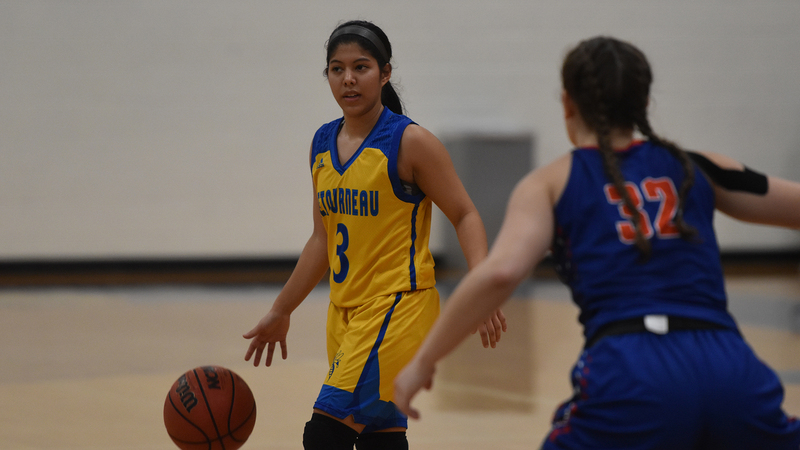 Three triples from junior guard Claudia Moonsammy in the second period would help the YellowJackets stay within in reaching distance, as LeTourneau would trail by a score of 33-30. A back-and-forth third quarter resulted in eight lead changes as the Wildcats jumped ahead by four to start the half before the YellowJackets fought their way back once again to take a 45-42 lead on a Keauna Whitfield triple. The two teams would keep the battle going throughout the rest of the quarter as the score would be knotted at 52-52 heading to the fourth. The Wildcats offense stepped up their game when it mattered most, putting up an 11-0 run on the YellowJackets midway through the fourth quarter. Alexandria Thorne and Sha’Donnaver Young were quick to respond as they teamed up for seven consecutive points pulling their team within four at 65-51. With LeTourneau trailing 69-64 with 21 seconds left, Whitfield would pull LETU within two with a shot behind the arc to give the YellowJackets one last opportunity to complete another comeback. It would be the Wildcats however who would prevail by using a perfect four-of-four performance at the free throw line to seal the deal and take a six-point victory. The YellowJacket offense shot a season-high 48.1 percent (26-of-54) from the field by connecting on 50 percent of their shots in the first quarter and nailing 10 of their 28 (35.7 percent) attempts beyond the three-point line. The Wildcats took advantage of their 19 forced turnovers, scoring 13 points off the opportunities. LETU only saw 12 points come from their 17 forced turnovers. A trio of LeTourneau players would find themselves in double digits as Thorne led all scorers with 21 points followed by Young with 19 and Whitfield scoring 12. LeTourneau will head back out on the road next week for a 5:30 pm matchup at the University of Ozarks on Thursday, January 24. The Eagles will enter Thursday’s contest coming off a loss against conference foe Texas Dallas, dropping them to 9-8 overall and 6-3 in ASC action. Free Throws, Defense Sparks LeTourneau Men’s Basketball 97-94 Home Win Over Louisiana College. LONGVIEW, Texas – Using a 54-point first half and 41 points from junior Nate West, the LeTourneau University men’s basketball team earned a 100-84 home victory over Belhaven University at Solheim Arena on Thursday, January 17. Picking up their 10th win of the season, LETU is now 10-6 overall and 6-3 in the American Southwest Conference while the Blazers drop to 7-8 overall and 2-6 in ASC action. With a hot hand from the opening tip, West would score the first six points of the game as the YellowJackets and Blazers would wind up trading the first 12 points of the contest to set the tone of an anticipated high-scoring affair. A smaller 5-0 spurt by LeTourneau allowed LETU to reclaim the lead at 11-6 but saw Belhaven score the next six points of the contest to briefly take a 12-11 lead with 14:27 remaining in the first half. The back-and-forth continued between the squads with a 15-15 tie getting broken by a C.J. Bird layup which would be part of a 10-0 run to put the YellowJackets up 23-15 to gain some breathing room heading into the final 10 minutes of the first half. West would continue his scoring touch throughout the first half, going on an 8-2 run for LETU to give LeTourneau a 36-22 lead as part of a 22-point first-half outing for the Houston, Texas native. LETU would continue to pressure and take advantage of self-inflicted wounds by the Blazers, pushing their lead to as many as 21 in the first half to grab a 54-33 lead at the break by scoring six of the final nine points of the period. LeTourneau would look to build upon their 20-plus point lead in the opening stages of the second half but could not rely upon the first-half momentum following a West layup to give the YellowJackets their largest lead of the game at 56-33. Belhaven would continue their efficient offensive performance and slowly chip away at the LETU lead by using an 8-0 run to pull within 13 at 61-48 with 16:27 remaining. The YellowJackets once again would take over and by scoring seven of the next nine points to push the lead back out to 18 at 68-50 and eventually matching their largest lead of the game just a few minutes later (75-52). LeTourneau had a task of facing yet another Belhaven run as the Blazers refuse to go away quietly, managing to close within 11 at 82-71 with 6:02 remaining following a layup and free throw for Laramie Long. 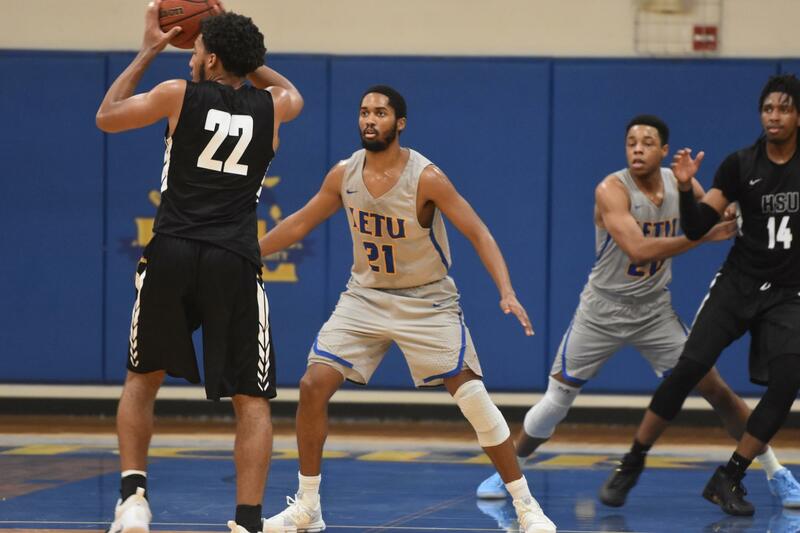 In the final six-plus minutes of action, LETU would manage to keep pace with Belhaven and use an 8-2 run to put the game far enough out of reach at 94-75 with 3:19 remaining and would eventually settle for the 16-point win. In addition to a new career-high with 41 points, West would also shine defensively with four steals and three defensive rebounds. Caleb Loggins would add 17 points of his own to go along with four steals, eight rebounds, five assists, and two blocks as the first of his two blocks would set a new LeTourneau University career-record. The Lewisville, Texas native now has 150 stuffs in his YellowJacket career. The YellowJackets would also feast on 28-8 points off turnovers advantage to go along with a 23-12 difference in fast-break points as Belhaven would be unable to overcome just four second-chance points. Back in action on Saturday, LeTourneau will host Louisiana College for Battle of the Halls at Solheim Arena with tip-off scheduled for 3 p.m. The Wildcats were handed a 94-80 road loss on Thursday at East Texas Baptist University and will enter Saturday’s contest with a 13-3 overall record and 6-2 mark in the ASC. Hot Start, Late Push Gives LeTourneau Men’s Basketball 100-84 Victory Over Belhaven. LeTourneau would be tasked with facing yet another Belhaven run as the Blazers refuse to go away quietly, managing to close within 11 at 82-71 with 6:02 remaining following a layup and free throw for Laramie Long. Caleb Loggins would add 17 points of his own to go along with four steals, eight rebounds, five assists, and two blocks as the first of his two blocks would set a new LeTourneau University career-record. The Lewisville, Texas native now has 150 stuff in his YellowJacket career. Back in action on Saturday, LeTourneau will host Louisiana College for High School Team Day and Battle of the Halls at Solheim Arena with tip-off scheduled for 3 p.m. The Wildcats were handed a 94-80 road loss on Thursday at East Texas Baptist University and will enter Saturday’s contest with a 13-3 overall record and 6-2 mark in the ASC. LeTourneau Women’s Basketball Wins 46-44 Home Thriller Against Belhaven. 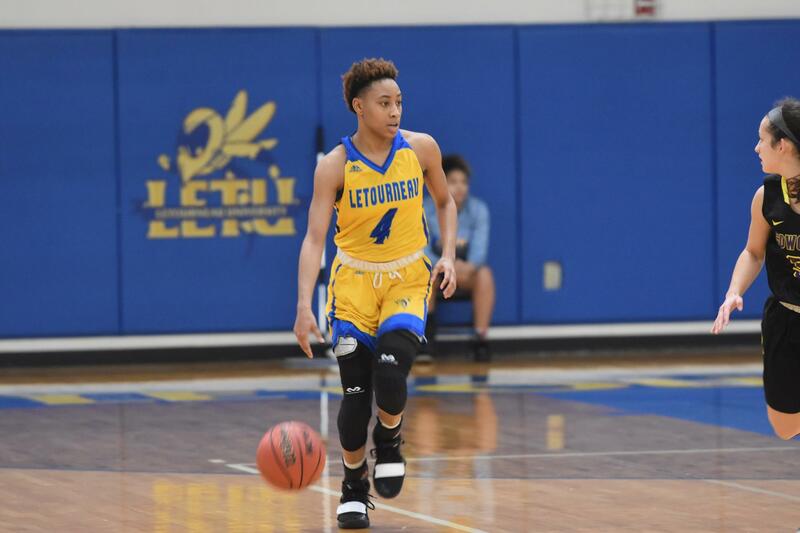 LONGVIEW, Texas – A missed shot at the buzzer fell in favor of the LeTourneau University women’s basketball team as they hung on for a 46-44 victory over Belhaven University at Solheim Arena on Thursday, January 17. With the win, the YellowJackets pick up their second American Southwest Conference win of the season to improve to 2-7 in ASC action and 5-11 overall as LETU would lead for the entirety of the contest. The Blazers fall to 7-9 overall and 3-5 in ASC play following the defeat. After a series of turnovers to start the game, the YellowJackets were able to gain control and jump to an 8-2 lead with 4:52 left in the first quarter. Four straight points from Chauntel Acosta carried LETU into the second period with a six-point advantage at 12-6. Belhaven would see a spark in the second quarter as they found enough momentum to go on an 8-3 run and deadlock the game at 16 all with 4:47 left until halftime. The LeTourneau offense would regain control as they refused to give up their lead by seeing Keauna Whitfield put up five points to end the half to give her team a 21-16 lead at the break. Scoring six of the first eight points in the second half, the Blazers would look to take their early lead of the game but were stopped when a potent LETU offense went on a 10-0 run to make it 33-22 midway through the third. The YellowJackets would see their 10-point run pay off as Belhaven would only be able to outscore LETU 7-5 in the final minutes of the third quarter which gave LeTourneau a 38-29 lead going to the fourth. The fourth quarter would prove to be crucial for the Blazers as they set their sights on a comeback. As has been the case in previous games this season, the YellowJacket offense would be forced to work against full-court pressure as the Blazers cut the lead down to four at 42-38 with 3:49 remaining. Points would be at a premium in the waning moments of the game as the Blazers would be given one final chance with three seconds remaining as Aaliyaha Thornton drove to the basket and drew a foul to go to the free throw line. After missing both shots, the ball ended up in Belhaven hands as they heaved up one final shot under the basket watching it bounce off the rim and onto the floor as time expired to give the YellowJackets a two-point victory. Whitfield continued her impressive sophomore year campaign as she picked up her fifth double-double of the year, scoring a team-high 20 points while also grabbing 10 rebounds. Turnovers would be problematic for LETU as they coughed up the ball a total of 25 times while taking it away from the Blazers 19 times. LeTourneau would manage to hold Belhaven to just a 48-46 rebounding margin as the Blazers entered the contest with a season average of plus-eight on the boards. LeTourneau will return to Solheim Arena and their home court as they continue ASC action with a 1:00 p.m. matchup against Louisiana College on Saturday, January 19. The Wildcats will enter Saturday’s game holding a 6-9 overall record and looking to bounce back after a Thursday night loss against East Texas Baptist in Marshall.